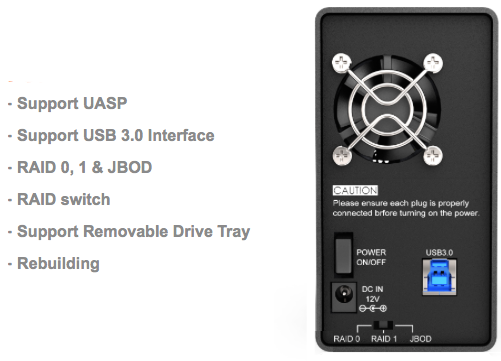 Readers have been asking when someone will release a USB 3.0 RAID enclosure. 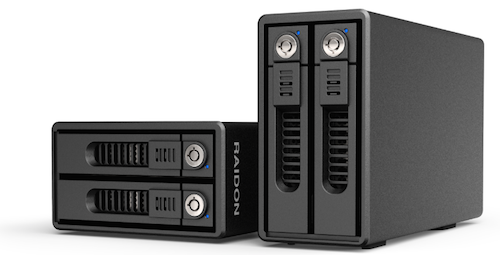 Raidon has a new product, the SafeTANK GR3660-B3 SSD/HDD RAID. With the limited bandwidth of USB 3.0 compared to Thunderbolt 2.0, a dual bay version makes perfect sense. We tested it with both SSDs and HDDs. The SafeTANK GR3660-B3 was connected to a USB 3.0 port on the 'late 2013' MacBook Pro Retina running OS X 10.9.5. RED graph bar means the fastest overall in Megabytes per Second. We used AJA System Test to test file level sequential transfer speed using a 16GB test document. We used a range of 4K to 1024K blocks in the Standard Random test of QuickBenchas a predictor boot volume 'house keeping' performance and a simulation of an application that does multiple small random transfers. Again, RED graph bar means the fastest overall in Megabytes per Second. The SafeTANK GR3660-B3 was easy to set up with its "RAID-in-the-box" approach. You can select either RAID 0, RAID 1, or JBOD using a switch in the back. Then power up the drive pair and format the volume with Disk Utility. The SafeTANK comes with mounting holes for both 2.5" and 3.5" form factor drives, so you don't need special trays to use 2.5" HDDs or SSDs. You know by now that BareFeats digs SSDs. Though we didn't expect the Samsung 840 EVO 1TB SSDs to achieve their 1000MB/s potential as a striped pair, in RAID 1 mode, they transfer large sequential data sets at twice the speed of either model of 7200rpm HDD. And they blow away HDDs transferring small random data sets in both RAID 0 and RAID 1 mode. And at $135 USD, it is affordable. Feedback or comments? Feel free to email me, Rob-ART, Mad Scientist. Order the SafeTANK GR3660-B3 from Addice Inc. Watch Amazon and Other World Computing as we expect them to carry this product in the near future. MSRP is $135 USD (empty).